Stefan Loose 2008 - NEW guide book from Germany: Sabine's Smiling Horses (Tel: 2-645 6894, 8-385-2424, www...), Vollmond- und Sonnenuntergangstouren, Touren zu Wasserfaellen..., fuer Anfaenger und Sattelfeste auf gesunden Pferden. Sabine kennt die Gegend wie ihre Satteltasche. 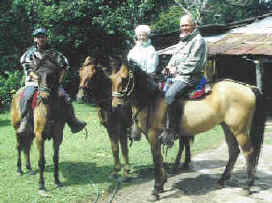 Best choice in Lonely Planet Costa Rica 2010: Sabine's Smiling Horses (Tel: 2645 6894, 8385-2424, www...), ...This outfitter has been highly recommended by readers year after year. 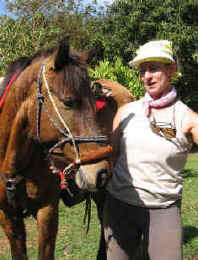 also Lonely Planet 2011 to Central America : Sabine's Smiling Horses...., run by Sabine who speaks English, French, Spanish and German and offers a variety of treks, from $ 15 US per hour day trips to specialty tours including a Full Moon Ride... Several multi-day treks are also on offer... This outfitter has been highly recommended by readers. 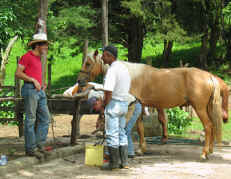 The Tico Times Exploring Costa Rica 2010: ...well-trained, cared for horses. 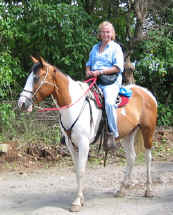 New Key to Costa Rica 2010 http://mapcr.com/information/1965/60/Costa-Rica-Sabine's-Smiling-Horses.html Sunset and moonlight tours, and tours to waterfalls. Sabine carefully selects horses for children to ride, and kids will enjoy her farm, with ponies, ducks, rabbits, and guinea pigs. Horse lovers can volunteer at the farm. Sabine has a nice vacation house for rent. when the group started trotting and then cantering. well. Please send me his name so I can mention him in our trip advisor review. Thanks again Sabine, we all had a great time! hoping to come back another time for a ride. How are you? I have been back in Los Angeles since last Sunday. I miss Costa Rica, and mostly Monteverde. Thank you for the horse-riding experience. I am normally a tense, nervous, stressed out, and irritable person, but the riding experience brought me joy and peace. I felt this peace and contentment in my heart. When I rode, I lived in the moment, letting go of my baggage and forgetting about all my troubles. I miss that peaceful moment and I hope I can remember that feeling when I become sad or stressed out. Alvaro was a wonderful guide. During our ride, we were just talking. It was like hanging out with an old friend. He was very nice and patient (especially with my lack of experience and broken Spanish). It really was a special day. believe many animals are healers to humans. Thank you for tending the horses with kindness, so that they continue to bring us humans joy and innocence. Lastly, give a hug and kiss to Luna Azul (and her friend-- I forgot her name)... Please let me know if Luna got pregnant. Take care and hope to see you again. Pura Vida! 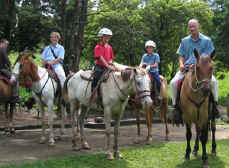 One of the Highlights during the Costa Rica holidays is the backhorse riding in Monteverde. This is a recommendable activity which is really great!! It’s fun and the best chance to discover the surroundings of Monteverde. 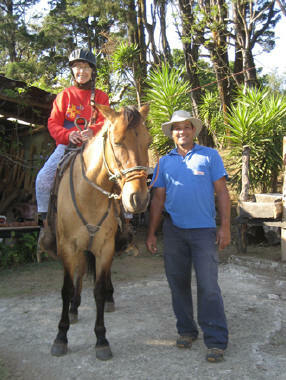 Even for not experienced Sabine’s Smiling Horses (www.horseback-riding-tour.com) is the best choice. Sabine speaks several languages (engl. German, Spanish and France). She explaines everything very detailed so that you fell very secure on the horses. The Farm is really nice, the guides experienced and the horses are treated very well..something that cannot be said for all the stables in Monteverde. The Waterfall Tour is great. After two hours of scenic riding through the hills of Monteverde you get to this amazing waterfall and get refreshed jumping in!! 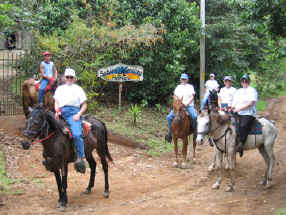 This is for sure one of the Top activities to do in Monteverde !! This is really just a thank you for the whole weekend! because the earlier I buy the tickets the better! Did I say that I had a great time this weekend? I hope all is well. Julia and I came home to light snow and very cold weather. Thank you very much for helping us have a wonderful first visit to Costa Rica. We enjoyed your horses, your house and your company. I have some very nice photographs including the one I attached. Just wanted to thank you again for a lovely time at your farm and with your horses. I had a wonderful time. It was so nice to spend time with you and your daughter and I wish you the very best for your future. Thanks for the book CD - haven't had time to read it yet, but during my time off this summer, I will for sure enjoy it. I enjoyed the trip to the airport also - the driver was a wonderful man who spent the time teaching me much Spanish! Take care .... please say hi to Tara and Alberto for me! Merci pour tout Sabine, j'ai passe un fabuleux moment. Grace a toi j'ai vecu une experience extraordinaire avec les Ticos et les chevaux de Monteverde. I thoroughly enjoyed my stay at your home. Between our lively discussions, your delicious cooking, Tara's musical voice calling "Mammina", your mom's contagious smile and the horseback riding, I couldn't have asked for more. I wish I had the time to stay a little longer, and get to talk to you some more. Maybe some day. Monteverde is a beautiful and magical place. You have lovely horses. And Jimmy is a good companion. All in all, I had a great time, and you'll always be in my memory. Once again you have provided the reason we came to Monteverde, 4,000 miles just to see you and Tara and ride your horses: You have the happiest, most smiling horses! They are so well taken care of and given so much love and it shows. Juliann and Apache are of the same mindset, as usual ; James and Sirena meshed perfectly; Dorado was the right mount for Gary again (nice and easy) and Linda, my girl, the pinto - - well, if I could figure out a way to sneak her home with me she would be mine! 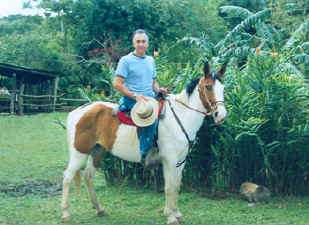 I don't know how you figure out what personalities just click for riding in Monteverde. It was a pleasure and made our trip and we'll see you next year ! we made it back home and I went right to work. we miss you so much. seeing our pictures reminded me of how you opened your home and heart to us (and shared your horses). I am trying to send pictures. Just a quick note to let you know that we've finally developed our film from our trip! To our delight, we have many pictures from our afternoon visit with you, Tara and the goat. I would be happy to send them your way--do you prefer to receive them via e-mail? We (Brad, Amy, Nate and myself) spent some time after our ride talking (and laughing) with Tara and trying your delicious goat cheese. I must admit that it was one of my fondest memories of our trip. You and Tara are certainly an amazing duo! Let us know if you'll ever be in the States! I'm just now downloading my pictures of Costa Rica and wanted to send the photos of your adorable daughter. Satoko and I thoroughly enjoyed our ride earlier this week! It was pleasure meeting you and Jimmy. Thanks for your hospitality and for such a great experience. I just wanted to send you and your horses a quick note of thanks and gratitude for the trail ride. (sunset ride) It was one of the best trail rides I have been on in a LONG time. Your horses are beautiful the guides were super friendly and the whole experience was just great. I was only in Costa Rica for about a week. I was traveling with my Friend Missy, who used to live in Santa Elena about 3 years ago. I don't know if you remember her but she remember you and she was excited that I had such a good time on the ride as well. Thanks again for adding to a great experience and take care! nach ein paar erholsamen und warmen Sonnentagen in Manuel Antonio sind wir wieder wohlbehalten in Deutschland angekommen. Vielen Dank für den guten Tip und die Hotelreservierung „Verde Mare“ mit direktem Zugang zum Strand. Die Tage und das Reiterlebnis in Monteverde sind uns in bester Erinnerung. Wir denken oft an die erlebnisreichen, manchmal leicht strapaziösen Reittouren (das Wetter war sehr sruermisch) zurück. Der Ritt und anschließende Aufstieg zum San Louis Wasserfall war ganz großartig, die aus 100 m Höhe herabstürzenden Wassermassen beeindruckend. Die Reittour über Felder, Weiden und Wälder bergab und bergauf mit Blick auf den Pazifik vermittelte uns einen hervorragenden Überblick über die einmalige Landschaft. Etwas stürmisch (wetterbedingt) war der Aufstieg zu den Nebelwäldern. Dennoch der Ritt durch die mächtigen Baumgruppen inmitten üppiger Vegetation war der absolute Höhepunkt unserer Reiterreise. Vielen Dank für das Arrangement im Hotel Los Lagos am Arenal, einschließlich des Rundrittes um den Vulkan. Faszinierend die parkartige Anlage des Hotelkomplexes, der Rundritt um den Vulkan und der abschließende Blick am Abend vom Thermal-Pool auf die glühende Magma, die aus dem Arenal abwärts floß. Dank an Jimmy, der uns bestens an diesen Tagen führte, und an Deine Pferde, die sicher und ohne Probleme die schwierigsten Situationen meisterten und denen man vollkommen vertrauen kann. „Sabines smiling horses“ sind ihrem Namen absolut gerecht geworden. 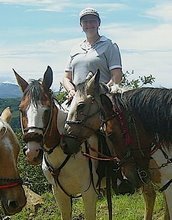 Hi Sabine- Just wanted to tell you again how much we enjoyed riding your horses, and seeing the beautiful views! Could have done with a bit better weather, but all in all, it was certainly one of the highlights of our vacation. If you are ever up in North Carolina you must come visit and try our Paso Finos! Sabine, just a note to let you know how much my family & I enjoyed the 3 hour ride that Jimmy guided us on last Tuesday. My son Jimmy was so confident with the horse he rode that he has now decided he wants to canter a lot more at home! Unfortunately, his 30-year old mare doesn't quite agree--he may have to move up a level in horses due to his increased confidence and enthusiasm. Thanks again; we thoroughly enjoyed our trip to Costa Rica and hope to be able to return someday. Dear Sabine, I had originally E-mailed you a thank you note for the wonderful experience you provided us with. At any rate, I just wanted to say thank you once again for the absolutely wonderful time that you provided us during our stay with Elsa. Our horse back riding experience followed by a yummy lunch complete with champagne was one of the highlights of our trip. 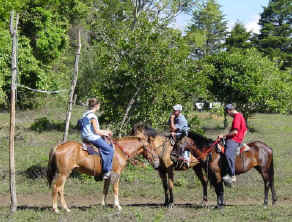 All of us absolutely loved the horse back riding, and the guide that you sent along with us was wonderful. I can't remember when I last had so much fun. Thank you so very much for all the tender, love, and care that you bestowed upon us. It was a wonderful experience -- and such fun to meet you and your adorable daughter. Ich besuchte dich im April 04 aus der Schweiz und wohnte bei Verwandten in San José. Sabine, we made it back to the U.S. We are still in shock. I don't know how to tell you what an absolutely great time we had with you and Tara and Jacques. We all cried when we left. All we talk about is the wonderful farm we stayed at in Monteverde. We loved it!!!!!! It was probably the highlight of our trip. Thank you, thank you, thank you. Our trip itinerary worked out very well and went smoothly. Thanks. We especially enjoyed our 3 day stay at Sabine's Smiling Horses. While this house might be too rustic for some, it was perfect for us. Allegra enjoyed it so much she cried and was heart broken when it was time to leave (she did stop crying when we got to the beach at Pto. Carrillo). When I asked Allegra if she wanted to go back for another 2 weeks she responded with "two years"...now she wants to move next door. At Sabine's Allegra was up first thing in the morning to help Jimmy, Sabine's guide, getting the horses from the field, and feeding them along with the rabbits and goats. She went on a number of trail rides (see smile on photo) plus also got to spend as much time as she liked riding, brushing and visiting her favorite pony Pocito. Sabine,with young daughter Tara, were great hosts making us feel totally welcome and at ease in their home. Sabine is a very interesting, intelligent, warm person with whom we spent many hours in interesting conversation. Sabine believes strongly in ethical and humane treatment of animals. Her horses reflect that treatment. Angela and I also went on a nice trail ride while there. We all enjoyed our visit to Sabine's far beyond any expectation we had. We've promised Allegra (and ourselves) another visit. We enjoyed our trip and the diversity that Costa Rica offers. We will be back. We wanted to write to thank you for one of the highlights of our recent trip to Costa Rica, the four-hour ride my wife Jacqui and I took with Jimmy and your horses on March 11th. It was the most fantastic way of seeing the beautiful countryside around Monteverde and Santa Elena, and a most relaxing and enjoyable adventure. The route we took gave us a terrific blend of open views to the cloud forests and across to the ocean, and more enclosed woodland riding, seeing the coffee plantations and some of the more exotic plant life thereabouts. More important to us than our enjoyment, however, was the knowledge that your horses are so well loved and cared for. We were most impressed with your operation and it is clear that you love your work and your horses very much. Jimmy is an excellent guide too, and is also clearly happy as happy with the horses as they are with him. 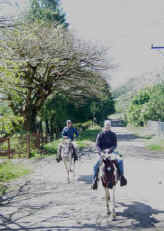 We look forward to our next visit and ride, and in the meanwhile can't recommend you highly enough to anybody thinking of a horse ride in the Monteverde area. Thank you again for a wonderful experience, and feel free to post these comments and attached pictures into your guest book. I wanted to thank you for a wonderful afternoon of horseback riding! You picked out the perfect horse for my level of experience. That made the ride even more enjoyable, I would like to have him at home! The trails were truly beautiful and the scenery was spectacular. I have attached some photos that I took along the ride. Just wanted to thank you for the great experience I had riding Mapa on the moonlight ride a week or so ago (I'm the tall Australian guy). I'm back in Seattle now and have passed on all the pamphlets to some friends of mine who will be in Monteverde soon and will be coming out for a ride with you. I got home from my Costa Rica trip, which was great, especially the riding part with you. I enjoyed every minute of it, the tours were always better than I expected, were on time and the horses are in great shape, full of life and very handy. I also appreciated the way you treated me as a customer before I got there, with all the details you gave me, I didn't have to worry about organizing my days in a foreign land, collecting info, you gave me the peace of mind. I thank you very much for the wonderful times, I definitely will contact you on my next trip, and recommend your stables to anybody I know traveling to Monteverde area. Sabine, Lois and I got back a couple days ago and I am taking the first chance to check in with you. How is the baby goat? And the foal? And Tara? As predicted, though the rest of our trip was GREAT, your place was the best. Where else could we get such non-stop action, animals, kids, scorpions, great food, fun conversation, and horse riding to boot. We spent the rest of the trip wondering how everyone was doing. We found one more scorpion on our trip. Just the day after leaving you, at Selva Bananito, I was taking a shower. They have no electricity, so it was pretty dark when I went to dry off. Lois said, "We should shake our towels like we learned at Sabine's." Just for fun, I gave mine a good shake. Luckily the scorpion was on the side AWAY from me...I uttered my only curse words of the whole trip. I just couldn't believe this was happening. foreign country. Your calmness and patience is perfect for animals, children, and guests. Lois and I would be back to visit you in a minute if we could. If you can find the time for an occasional e-mail, we would love to keep track of you, your adventures, and your life. I expect we WILL be back in Costa Rica again before too long, and I know we will absolutely want to see you. Say hi to Tara, Jack, Jimmy, the goats and horses. 15 January 2004 Hi Sabine! all back in California now, and can*t stop talking about what a good time we had. We*re so sorry that by the end of the trip, we were a little short on cash. We really wanted to give Jimmy and you something extra because we really did appreciate the experience. Jimmy was so wonderful and attentive to our needs. We really feel that he went above and beyond. That*s why we wanted to send him a *care package. * If at all possible, can you forward and his contact info (and yours) to us (i.e. address/email)? and tell Apache I miss him! Hi Sabine, we just came back from Costa Rica yesterday and are miss the beautiful country already. New York is so cold and have snow on the ground! I have great news to share with you. Guess what?! I got my camera back! The couple who went horseback riding right after we did recognized us (they saw our pictures on the digital cameras are great :) in the bakery where we were eating lunch next day. They took us to the stable and the guide had camera in his house. 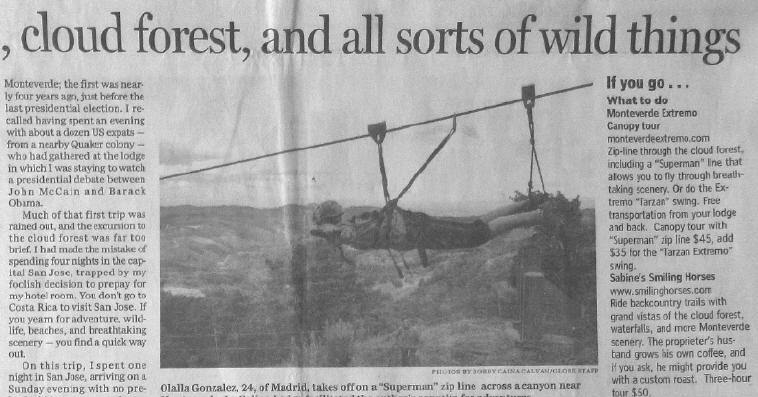 I think the name of the guide was Domingo. I was so happy and I tried calling you to let you know the news, but the number I had was obviously wrong and couldn't get through. I feel terrible that I made you so worry and spending your whole afternoon for looking for my camera. Thank you so much for being so kind and wonderful. You made our trip even more special. I didn't have the chance to tell you this because I was so upset the day. However, I enjoyed my ride with Sirena very much! Your hourses are so beautiful and I wish we could go back to Costa Rica and see you and them sometime soon. Thanks again and say hello to Tara for me. You have all become our fondest memory of Costa Rica! When asking James and Juliann their favorite part of our 7 days, they always say "Sabine's" Of course, It was why I came to Costa Rica to meet you face to face. Even my usually stubborn husband had to admit this what was what he loved. Next time, we will skip the resort area and come to Sta Elena. Sabine, your hospitality was everything and more than I could have hoped for. You should have the biggest business there as you are the most hospitable with the best horses. I hope you will allow us to hook your web site to ours and help promote Sabine's Smiling Horses in the US both through our website and word of mouth. We do this free, of course, since you have done so much for my family. You made memories that can never be erased. I miss you and want to come back already!